As we face a Fake Brexit, we should ponder just how it has come about that while nearly 60% of us (if you adjust the actual % vote for Brexit – 52% – for the fear factor generated by Project Fear) want an independent Britain, 85% of our “representatives” (sic) in Parliament – those MPs who supported Remain – want our continued subservience to a foreign power. Are these really our representatives? Britain has not been conquered by a foreign invader for nearly a thousand years. Not militarily, that is. But you can just as effectively “take over” a country by other means. This can be done by either (1) successfully taking over its vital institutions as a precursor to government, or (2) a revolution or coup d’etat. An example of (1) was the aftermath of the Boer War: although the British won the war, the vital institutions – media, education, civil service, local government etc. were all run by the Afrikaaners, who were the majority white population and by the 1920s they had taken over the government. An example of (2) was the Russian Revolution or French Revolution but such coups can happen over time and even without violence. In the 20th century, Britain suffered a “pincer” attack from both outside – (2) and within – (1). Like a vice closing. Whereas our glorious Royal Navy and RAF had always beaten off a foreign invader, we found ourselves wide open to these more subtle attacks and so we were eventually beaten by them. internationalism and multiculturalism, anti-Christian, anti-family and anti-democratic. and now even the police. Our traditional conservatism and classical liberalism have been side-lined from our national life, Christianity is in decline and Islam advances. state will be sidelined and be subservient to corporations and banks. the parts of the world which really “mattered” then. Globalists in the US such as George Kennan, Paul Warburg, David Rockefeller, the Dulles brothers and others were very influential in the US Establishment. The latter decided that the major European powers, including the UK, should “unify” (a) as a bloc to counter the USSR (b) to constrain Germany inside a supranational government and (c) to optimise economic growth (supposedly), again to ward off communism. before the war, but who now found themselves backed by the most powerful country on Earth. In particular, the CIA was used to inspire and finance the European Movement. Post-war reconstruction in Europe was helped enormously by US “Marshall Aid”, but what is very little known is that this aid was not just “given” ( the US never does that). Marshall Aid was only given on condition that the recipient joined in the process for European unity. The US could easily dictate to the defeated powers – Germany and Italy. France needed some persuasion but joined, because she would be the leading power in it (for a while). were bankrupt in 1945; very few know that we were also bankrupt in 1940. Without Lend-lease from the US from 1941, it is a little-told fact that Britain would have had to come to terms with Germany because we had literally run out of money; this is because we could not just borrow from the US, as in the Great War: their Neutrality Act now forbade lending to “foreign belligerents”. Lend-lease came with long-lasting strings attached. Post-war UK Governments, both Labour and Conservative, and also the Foreign Office, were opposed to joining a European union. But US pressure was enormous. As we know, the US has a standard tool they use when dealing with a foreign government which does not obey its wishes: “Regime Change”. 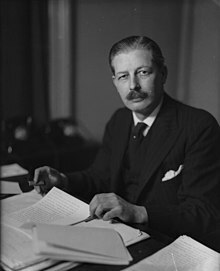 Following our humiliation by the US in 1956 when we were forced to withdraw from Suez under threat of crippling US financial sanctions, we had our own taste of regime change: Macmillan, who succeeded Eden as PM in 1957. He sold out and applied to join the Common Market in 1961. The US was very pleased. Labour quickly followed suit, particularly after the strange and premature death in 1963 of its leader Hugh Gaitskell, who opposed joining the Common Market. The rest of Britain’s debacle to the EU is well known. Wilson granted us a referendum on staying in the Common Market in 1975 but the people were given a false prospectus – it was presented as an entirely economic project. The “grand projet” is a political project but has always masqueraded as an economic one. So we voted to stay in. We ended up as not just subservient to the globalist US “Empire”, but a satrapy of its European subsidiary the EU, managed by our traditional enemies the French and Germans. Macmillan (left), who had seriously considered joining the Labour party before the War, founded a controlling Europhile dynasty in the Tory party which survives to this day. Thatcher’s Bruges speech in 1988, John Redwood’s leadership challenge in 1995, Ian Duncan Smith’s “accidental” Tory leadership 2001-3, the rise of UKIP and now the 2016 referendum result. But there is a long way to go. The anti-EU wing of the Tory party,albeit admirable, is outgunned by the Europhiles who hold all the levers of power and the bovine Tory membership, now way below its numbers in the past, has never shown anything but blind loyalty to the party leadership. But the people have not given in: UKIP WON a national election in 2014 with 29% of the vote in the last EU Parliament election, which is run on proportional voting. But here at home we are saddled with a scandalously unfair and corrupt electoral system domestically which produces outrageous and crazy results, and enshrines the two privileged parties – Blue Labour and Corbyn Labour in power on a rotating basis. The EU threat will only end when the EU ceases to exist. Until it does, a futureUK Quisling Government can always take us back in. We remain in a long war to restore our freedom. This entry was posted in BREXIT, The European Union (EU), UKIP and tagged BREXIT, EU, European Union, Harold MacMillan.